Stop by the Wild Frontier General Store for a refreshing cold drink, or an ice cold pint of ice cream. 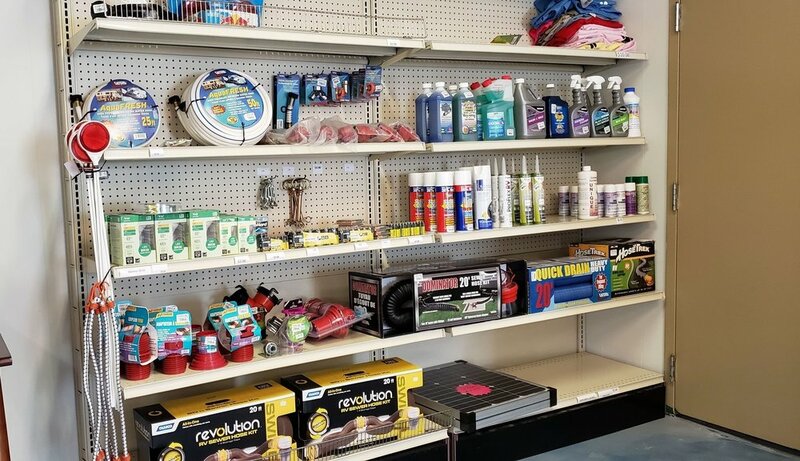 Or if you need some parts for your RV, we carry many of the basics in the store. In any event, we're always happy to see our guests, so stop by the store and say hello. We keep lots of different snacks available including sandwiches, chips, candy, gum, pastries, and ice cream. We stock RV replacement and maintenance parts at the store. Please stop in and see if we have what you need before heading off site for supplies. We keep the drinks ice cold. We've got water, gatorade, soft drinks, monster energy, and starbucks. It gets hot out there, stop by and get a cold drink. We also provide a desktop computer for guests to use while staying at the campground. The computer has a quick Internet connection and a black & white laser printer--complimentary.